For months Amanda dreamt of the day when she could finally transform her master closet. The founder of the Luxmommy blog regularly posts fashion tips for her fans, and wanted to share her closet renovation journey with them to inspire ideas for keeping a fabulous wardrobe, shoes, and accessories well-ordered and accessible. I am so obsessed with the way this closet turned out, and I still have so many more ideas to organize and decorate it. 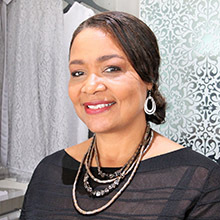 To achieve her desired vision, Amanda turned to California Closets Houston, where design consultant Reva Smith provided ideas for transforming the space into the dream walk-in closet Amanda always wanted. Together, they perused a range of inspirational images so that Reva could capture Amanda's chic personal style, while also working within her specific budget. Together Reva and Amanda collaborated on the design—deciding on floor-to-ceiling shelving with drawer sections and accents of mirrored backing to achieve a high-end look within her price range. The custom design gave Amanda the much-needed space she desired, maximizing the entire closet space and allowing her to really showcase—and easily access—her clothing and collections of shoes and handbags. We were both thrilled with the final result! Her decorative artwork, three fabulous chandeliers, and a gorgeous paint color really brought the space to another level. Fresh and organized with a touch of glamour, Amanda’s gorgeous closet shows how a very simple upgrade on a budget can make a major impact.